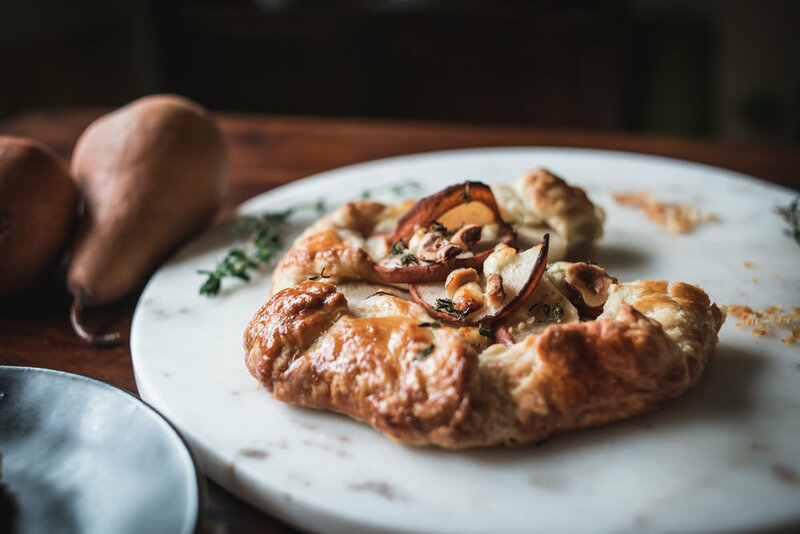 This Pear Galette with Blue Cheese, Hazelnut and Thyme came out incredible, I created the recipe on the fly and it worked perfectly. So I kept notes on what I did so that I could share it with you here. I think you will enjoy it. As you know (or may not know) I’ve been doing some videos lately, I wanted to do a stop motion video and thought it might be fun to make a galette since there’s a lot of assembly involved. Well mostly assembly as there is very little to do other than chop and slice a few things, and if you already have pie dough on hand it’s even easier. Which I recommend, pie dough freezes great, this is what I had leftover from the holidays. The stop motion video was fun to make, although it does take quite a while to create. The video below contains 56 photos, by the time I got to arranging the pears, Jeff helped out by hitting the shutter so that I didn’t have to clean my hands each time, which is what I did while rolling out the dough and I was getting flour all over my laptop (I worked with my camera tethered to my computer), so that was really helpful (thank you Jeff! ), I would recommend getting some assistance if you plan on doing a stop motion video like this, where there’s mess involved. I’m curious to know if you enjoy the videos and if there are any recipes that you would like to see in video format in addition to photos? You can leave comments here or Instagram or wherever you like. Recipe below! Enjoy! Roll out your pie dough to roughly a 10-inch round. Sprinkle the brown sugar on the dough leaving a 1-2 inch border. 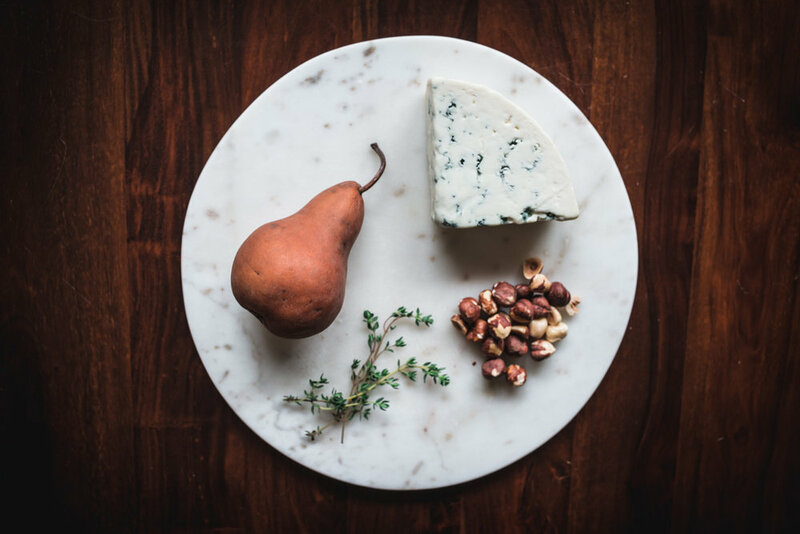 Add cheese, nuts and thyme (leaving a few ingredients aside for the top), then add sliced pears in a circular pattern, fold the edges in a circular pattern, top the center with the remaining cheese, nuts and thyme for color and texture. Brush the egg wash on the dough. Place on parchment lined baking sheet and Bake at 400° for 25-30 minutes until golden. Remove from oven and serve warm or room temp. To make the dough in a food processor, pulse together the flour, sugar and salt until combined, about 5 pulses. Add the butter and process until the mixture resembles coarse meal, about 5-10 pulses. Remove from processor and place dough in large bowl, add 6 tablespoons of the ice water, combine with wood spoon. The dough should hold together when squeezed with your fingers but should not be sticky. If it is crumbly, add more water 1 teaspoon at a time. Turn the dough out onto a work surface, divide in half and shape each into a disk. Wrap separately with plastic wrap and refrigerate for at least 2 hours or up to overnight. You can freeze the extra pie dough for MONTHS, it holds up very well. It’s that time of year again. All things Pumpkin! And dark. Well actually this October has been unusually sunny for Portland, but this past week the rain finally kicked in, raining every. single. day. oh no! But this time of year is also an opportunity for walks on misty mornings. I like this Pumpkin Bread recipe, it’s good but maybe not as good as the Pumpkin Loaf Cake with Walnut Glaze from four years ago. But I wouldn’t not eat it! It tastes great with a Double Spice Chai tea by Stash. This isn’t an endorsed or sponsored post, I just happen to love their tea. They do everything right. In a medium bowl combine flour, salt, baking soda, baking powder and Pumpkin Spice. In a large bowl whisk together sugar, brown sugar, milk and egg whites. Add the canned pumpkin and mix together well. Slowly add the dry ingredients to the pumpkin mixture, stirring until well combined. Pour the batter into the loaf pan, then sprinkle with sliced almonds. Bake for 55-60 minutes or until a toothpick comes out clean. Allow the bread to cool in the pan before removing. And I’m back with a Preserved Lemon recipe! 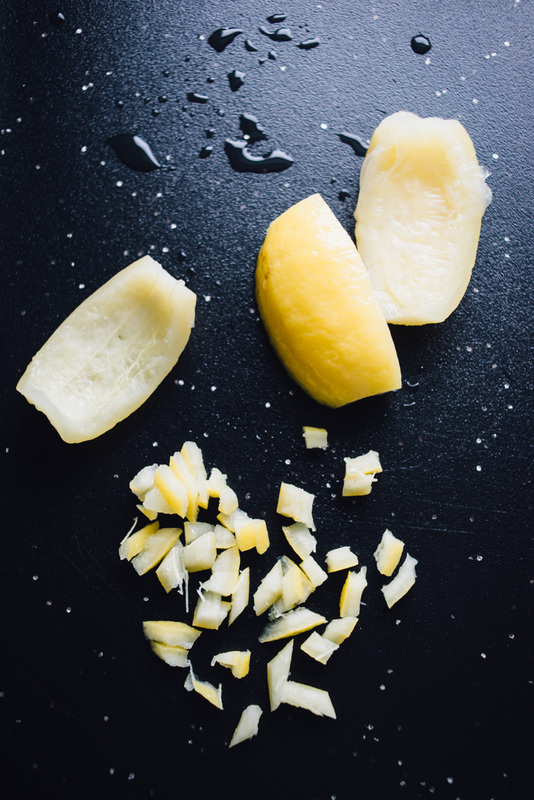 You might remember I preserved lemons in April and wanted to follow up with some ideas on how to use them. I’ve since added them to dishes like rice salad and they really add some great flavor. The lemons are super salty (even after rinsing) which makes me think I might have used too much salt, so something to keep in mind for next time. I got the idea for this Focaccia bread not too long ago. The bakery at my local grocery store makes this and wow, it’s incredible. It’s very flavorful, you can eat it on its own or with pasta or salad. For this recipe I used dried oregano, I wished I had used more so that it would look a little more “herby” for the photos. In a large bowl add olive oil, enough to cover interior of bowl. Place the dough in the bowl and cover the dough with some olive oil. Cover and let rise for 1 hour in a warm place. Press out the dough on a well oiled baking sheet. Using your fingers, shape into a rectangle approximately 9”x13”. Add olive oil to the top of the dough, poking the bread surface and leaving little pools of oil. Do this all over the bread. Don't skimp; this will result in great flavor after the bread is baked. 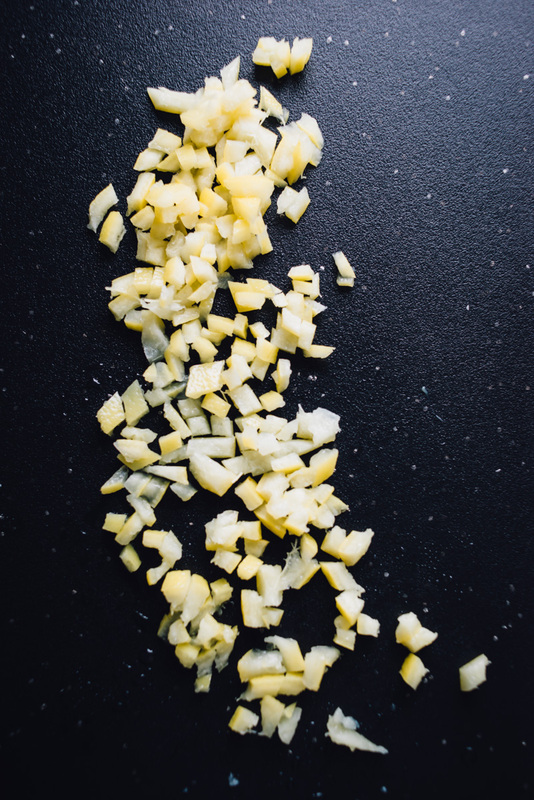 Top with the preserved lemon and oregano and sprinkle with coarse salt. Bake for 20-25 minutes until lightly golden. Wouldn’t you know. On Jeff’s Birthday I’m ready to make this cake and… the oven is broken. It won’t heat and it’s only three years old! Luckily I had only prepared the cake pans while attempting to preheat the oven, so it wasn’t a total loss. We had an extended warranty on the stove but even with that it took a couple weeks to be resolved. Like it didn’t work when the repairman showed up, then it did and he left unsure of what was wrong, and then it didn’t again so he came back the next week after ordering parts. Turns out the ignitor needed replacing. Anyway, back to cake! I changed a few things but mostly stuck to this recipe. The original recipe says to buy a coconut and drill holes in it, bake it, crack it and all sorts of crazy stuff I didn’t want to do, so I just bought coconut cream and milk in cans at the market. It came out great. Really great. The texture of the cake is perfect, it has a nice density to it. The flavor is exactly what you would want. I read the reviews on the cake and one of the biggest complaints was the frosting, that it tasted too much like marshmallow, and I knew I didn’t want that super sweet stuff, so I made a version of the frosting I made last year for Jeff’s Birthday Cake with Mascarpone and whipped cream. Last time I ran short on frosting, so for this recipe I doubled it, then I went lightly frosting the layers (as you can see), but I ended up with so much leftover! I was concerned about running out, but believe me you can pile on the frosting between layers and have plenty for the top and sides. This is a delicious cake and well worth making. Preheat the oven to 350 degrees F. Lightly butter 2 (9-inch) cake pans. Line the bottom of each pan with parchment paper. Butter the parchment paper and then flour the pans. Set aside. Place the flour, baking powder and salt into a large mixing bowl and whisk to combine. Combine the coconut milk and coconut cream in small bowl and set aside. Place the butter into the bowl of a stand mixer and using the paddle attachment, cream on medium speed until fluffy, approximately 1 minute. Decrease the speed to low and gradually add the sugar slowly over 1 to 2 minutes. Once all of the sugar has been added, stop the mixer and scrape down the sides. Turn the mixer back on to medium speed and continue creaming until the mixture noticeably lightens in texture and increases slightly in volume, approximately 2 to 3 minutes. Stir in the coconut extract. With the mixer on low speed, add the flour mixture alternately with the milk mixture to the butter and sugar in 3 batches, ending with the milk mixture. Do not over mix. In a separate bowl, whisk the egg whites until they form stiff peaks. Fold the egg whites into the batter, just until combined. Divide the batter evenly between the pans and bang the pans on the counter top several times to remove any air and to distribute the batter evenly in the pan. Place in the oven on the middle rack. Bake for 40 minutes or until the cake is light golden in color and reaches an internal temperature of 200 degrees F.
Cool the cake in the pans for 10 minutes then remove and transfer to a cooling rack. Wrap the cakes in plastic wrap and refrigerate, they will be easier to slice. While the cakes are chilling prepare the frosting (recipe below) Assemble: Cut across the equator of each to form 4 layers. Frost each layer with a generous amount, then top with coconut flakes. Beat together all ingredients in a stand mixer for a couple minutes until fluffy. Left over pie dough? Not quite enough for a whole pie? Other than making mini pies a galette is a great option. Fall officially begins tomorrow and as much as I want to hang on to summer, it’s best to embrace the new season. Each year it seems like a never-ending quest to figure out what to do with so many tomatoes all at once. It’s that time of year here in Portland where our yard becomes a (humble) bounty of berries.